Engulfed in rich history, nature and fun, Laguna is thus, also a must-see spot -- situated in the Calabarzon region of Luzon, and southeast Metro Manila, it promises to be a destination that will meet your travel expectation. Laguna is home to Pagsanjan Falls, the University of the Philippines Los Banos campus, hot springs around Mount Makiling, Paete wood carvings, and many more. #1 - Enchanted Kingdom: Truly living up to its name, Enchanted Kingdom, a fantastic amusement park on San Lorenzo Road, Santa Rosa, Luzon -- is absolutely ahead of the game. Your teens and kiddos will never be the same, as they feel Enchanted Kindom's Disneyland -like ambiance, see the firework, get onto the awesome rides, taste their wide variety of food, play sport games, do target shooting, etc. -- we can go on and on... Also ideal for lovers, or best friends, whether young or old -- so hurry, buy your tickets early, to be merry incessantly! 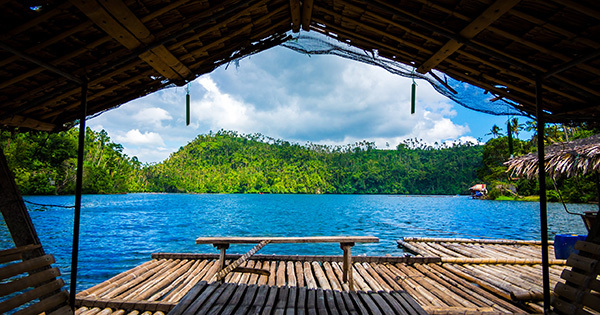 #2 - Lake Pandin: If you are fond of both the serene and the calm, don't think twice because it's wise to spend a relaxing day over in San Pablo City -- where stunning Lake Pandin is waiting just for you! You can literally have a picnic in the middle of this lake, do fishing, and even some swimming! Isn't that exhilarating? #3 - Pagsanjan Falls: Located in the province of Laguna, these are some of the most famous waterfalls in the Philippines. The three-drop 91-meter waterfall can only be reached by a river trip on dugout canoe which takes about an hour to get to, but it's worth the boat ride. #4 - Fun Farm at Santa Elena: A joy ride towards Fun Farm at Santa Elena -- located in Barrio Malitlit, Santa Rosa, will be one of the most unforgettable times for you and your kids. Just bring your own food and drinks, so you can have the best experience to feed the animals there, zip line, do fishing, horseback riding, boating, and so on... voila! You could just get an all-in-all, splendid day! What say you? #5 - Mount Banahaw: If you think you've just about had it, then go right ahead for some contemplation over at cool, peaceful and quiet, Mount Banahaw -- that occupies Kinabuhayan, Dolores. You will encounter Bangkong Kahoy Valley, the gateway to Mount Banahaw, where you'll meet very friendly and warm people. Ask to be led to Honesty Bar, a shop that sells fresh fruits and veggies, along with a unique wine called Wild Raspberry Lambanog. Other great stuff there include zip lining; horseback riding; and not to forget, walking on the hanging bridge, that leads all the way to Laguna.